With a picturesque setting on the slopes of Mt Batakaru Bali Eco Lodge provides a genuine haven for those looking to immerse themselves in nature and to experience the true essence of Bali.Charming, secluded bungalows with names like Tree House and Jungle Lodge cling to the hillside, wooden verandas offer birds eye views of steep valley walls blanketed in thick rain forest; far below you can see the sprawling coast of Kuta – so near, yet a world away. The first thing you will notice is the bird song– woodpeckers, kingfishers and parrots are at play in the forest canopy, black eagles streak across the sky , the looming peak of Mount Batakaru creates a dramatic backdrop. Natural building materials include local timber, like coconut and jack fruit, while floors are made of hand crafted terracotta tiles. Fresh cut flowers, colourful woven textiles, and warm patchwork quilts (the nights are chilly!) create homely comforts. The lovechild of dedicated environmentalists, Linda and Norm Vant Hoff, the lodge is about as ‘eco’ as it gets, with well documented green credentials, including the ‘Responsible Tourism Award’ in 2007 and 2010 (www.wildasia.net) The tenets of sustainability, low impact building techniques , effective resource and waste management, are all faithfully adhered to, everything is in perfect balance with nature; but we sometimes forget that there is more to the environment than physical factors. 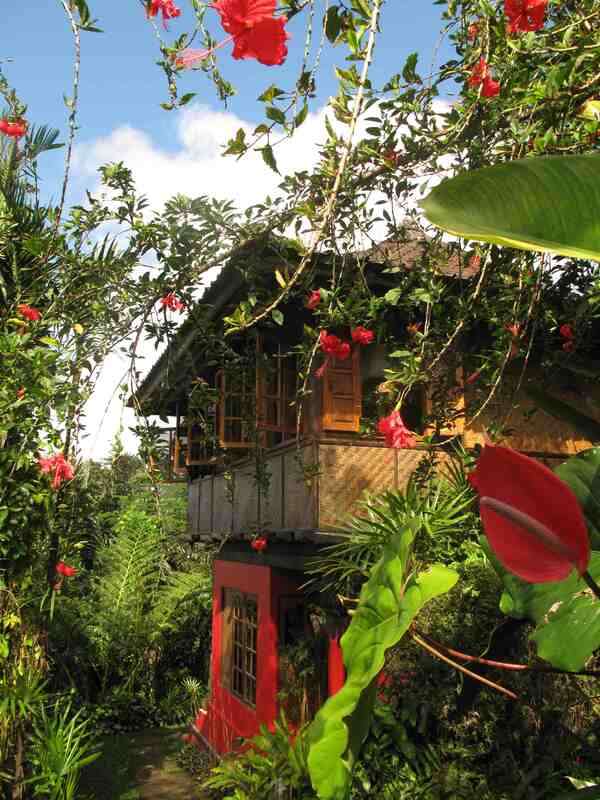 From Norm and Linda’s point of view, an eco lodge is “Sustainably connected to the natural, built and social environment”; and the lodge has become a valued extension of the village and community of Sarinbuana. While you enjoy the magical surrounds, delicious healthy cuisine and a range of activities, you can also relax in the knowledge that your stay here contributes to the local economy on a number of levels: The lodge employs 26 staff from the village and have trained locals as trekking guides and massage therapists. Ongoing community projects include extensive tree planting, free English, martial art and football classes for village children, the sponsoring of a university student; and ongoing additions and improvements to the school. It also acts as a role model for responsible tourism; promoting low impact activities, with an emphasis on walking, bike riding, and swimming in the waterholes. Enormous value is placed on the preservation and promotion of local culture, with popular workshops providing genuine insight into everyday life in Bali and the chance to learn traditional skills. Learn Balinese Calligraphy, Indonesian language, and how to play a traditional instrument, or join the village ladies who teach the art of creating beautiful temple offerings, table settings, and cooking; while Pak Ketut, a remarkable and inspired wood carver (responsible for the ornate carvings in the bungalows) shares his craft and his wisdom. When Norm and Linda first took over the property it was dominated by wild grass and coconut trees, eighteen years on the gardens are flourishing with over 100 edible and medicinal plants. The garden tour is a fascinating and informative journey with Manager, Putri, pointing out all manner of herbs, spices and plants, and explaining their traditional uses. Look out for the fiddletip ferns – they make a great salad served with shredded coconut and Lombok chili, while the dainty ginger flowers are equally tasty. Much of the produce served in the restaurant is picked fresh from the garden, or sourced locally, including coffee and cacao, and home made ice cream is flavoured with the vanilla that grows here. A meandering path leads down to the water holes passing sweetly perfumed orange trees, dense thickets of mulberry bushes , dangling passion fruit vines and a plethora of heliconia. Wooden benches and open air pavilions are scattered about the property, ideal for yoga, meditation and soaking up the silence. 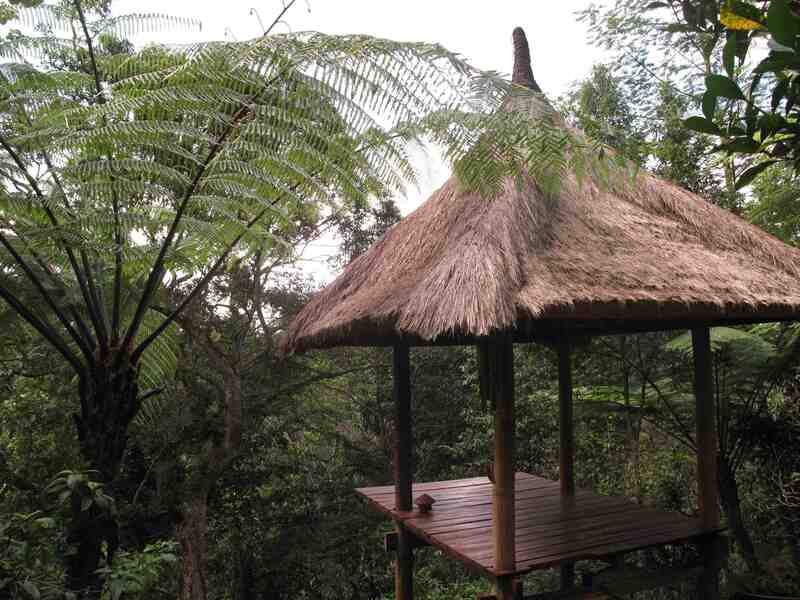 If you are feeling more energetic take an early morning hike up to the top of Batakaru, the track leads through the largest rainforest in Bali, home to luwak (civet) leopard cats and monkeys, emerging at a peak with view stretching over to Lombok and Java . 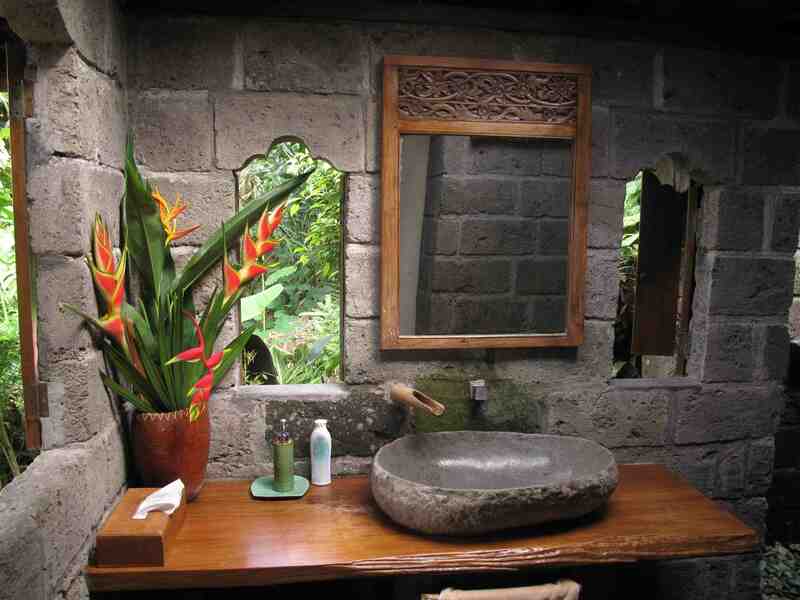 The beauty of the Eco Lodge is that it can be enjoyed on so many levels , hide away from the world in a secluded mountain paradise, or put yourself out there as you immerse yourself in the nature, culture and community. Make sure you spend some time with Linda and Norm so you can learn about their various eco projects around the island, including saving the Bali Starling, permaculture, solar energy. For Linda the Eco lodge has provided “A chance to give back” but she makes it clear that she gets back as much as she gives. For her the greatest joy is, “To be connected to the environment, the people and the land, making a living and a life with local people who are incredibly talented.” Here the Balinese concept of life, known as Tri Hata Karana is firmly in place – the three forces of happiness – harmony with god, harmony with man, harmony with nature.